12 Best Nutrients and Foods for Radiant Healthy Skin - Check the 5th one! How Diet Affects Your Skin? Your skin is a reflection of your health, and a wholesome diet boosts your overall wellness and promotes glowing skin. Did you know that what you eat and drink can affect your skin’s moisture levels, tone, and cause or reduce acne and even affect your hormone balance? For your most youthful looking complexion, you may want to think about your next bite and its impact on your skin. For example, avoid high fat and sugary foods and drinks for blemish free skin. Limit dairy products made from cow’s milk because the hormone levels increase sebum production which leads to breakouts. Ensure you are drinking 1 oz of water for every pound of body weight each day for a naturally dewy complexion. Foods that are high in healthy fats and omega-3 fatty acids can promote collagen production and help prevent premature wrinkles and skin sagging. Collagen boosting vitamin C and antioxidant vitamins A & E fruits and vegetables can plump your skin and fight inflammation for a healthy complexion. 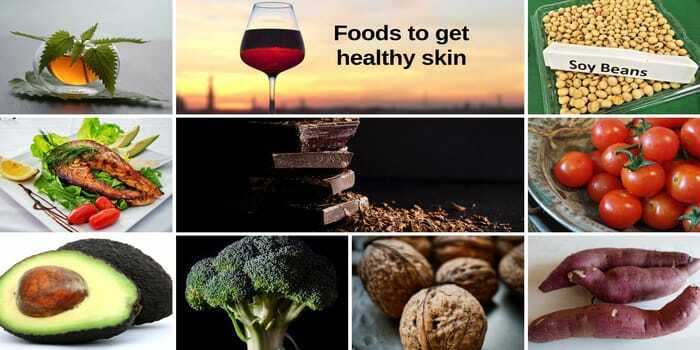 What are the best foods that keep your skin firm? Skin requires proper nutrition to remain firm. Here are 12 foods that can help you banish wrinkles, keep your skin supple and achieve a radiant glow. Oily fish like salmon, sardines, and herring are an excellent source of omega-3 fatty acids. These essential fatty acids cannot be made in the body, but when consumed they keep your skin supple and moisturised. These delicious fish also contain vitamin E and zinc to calm acne-causing inflammation and skin conditions like psoriasis and eczema. Walnuts boast an impressive array of skin-beautifying properties. This great tasting nut with a crunchy texture packs an omega-3 fatty acid punch to help lock in moisture and keep toxins out. It also contains zinc and vitamins C and E and selenium to reduce skin inflammation and help your skin heal. Avocados are rich in omega-9 fatty acids, antioxidants, and vitamins that help regenerate your skin. Omega-9 fatty acids keep your skin soft and supple. Collagen boosting vitamins C and E maintain the firmness and elasticity of your skin and vitamin E also protects your skin from harmful UV rays. The avocado is a versatile ingredient found in a variety of skin care products. Consult with any popular skin clinic in Putney to know the anti-ageing benefits of superfoods. Sweet potatoes contain many nutrients and have some fantastic benefits for your skin. Once ingested, their high levels of beta-carotene is converted to an active form of vitamin A which increases healthy skin cell production. They also contain Vitamin C promoting collagen production for plumper skin. Potassium and pantothenic acid serve as natural moisturisers and anthocyanins neutralise the free radicals that can cause fine lines and wrinkles. Vitamin E-rich sweet and nutty sunflower seeds are a powerful natural remedy for premature ageing. They protect your skin from free radicals and UV damage, and the essential fatty acids ward off inflammation, acne and other skin issues. The red pigment in tomatoes is a phytochemical called lycopene. Lycopene is a natural sunscreen that protects your skin from harsh UV rays. According to a study published in the Journal of Agricultural and Food Chemistry, cooking tomatoes increases the effects of lycopene and the antioxidant activity for even more benefits. Tomatoes are also packed with antioxidants like vitamin C to fight free radicals and inflammation. An article published in the European Journal for Clinical Nutrition recommends eating your tomatoes with a small amount of fat such as olive oil or even cheese to increase absorption of the beneficial nutrients. The delicious and nutritious bell pepper is a powerhouse of anti-ageing antioxidants for great looking skin. They are bursting with vitamin C which rejuvenates your skin cells, so you experience fewer fine lines and wrinkles. This cruciferous vegetable is high in skin boosting antioxidants. Vitamin E protects your skin from sun damage and vitamin C aids in collagen production to keep your complexion supple. Soy contains isoflavones which help to improve your skin’s elasticity and reduce wrinkles. Soy is especially beneficial to post-menopausal women because it mimics oestrogen and helps to plump up your skin’s volume and eliminate dry skin. Isoflavones also help to protect your skin from UV radiation. Green tea contains powerful compounds called catechins, and like other antioxidant foods on this list, it protects your skin against harmful sun damage. The antioxidant epigallocatechin rejuvenates your skin cells, giving dull skin a healthier glow. This superfood also contains vitamins B and E which help to maintain collagen production and hydrate and nourish the skin. Dark chocolate is a superfood with multiple beauty benefits. It can boost your skin’s moisture levels, diminish fine lines and protect it from harmful UV rays. It’s rich in vitamins A, B1, C, C and E as well as calcium and iron, and nourishes your skin from the inside out. A recent study published in the journal Dermatology and Therapy showed that reverastol and antioxidant found in grapes slowed acne producing bacteria, and you can now find red wine extracts in some skin care products. Additionally, the polyphenols in red wine inhibit cell oxidation that causes ageing of the skin.